Andrew & Sarah are the music directors of Adelaide Allsorts Harmony chorus. Andrew is our Musical Director shaping the Musical interpretation of our songs He was introduced to the joys of singing barbershop in England in 2007 with Oxford Harmony just before he moved to Australia. He directs and sings lead with Adelaide Allsorts, and lead with his mixed barbershop quartets Confusion and BarberQ He also directs The Fleurieu Harmony Chorus in Aldinga and sings Tenor In Adelaide Vocal Union in the city. Sarah is our Chorus Director and is responsible for running rehearsals and music education. Sarah has been a music teacher all her working life, and took up singing with Andrew in 2004. She sings In many quartets and is also the Music Director at Onkaparinga Harmony Chorus, a Sweet Adelines ladies chorus in Happy Valley. 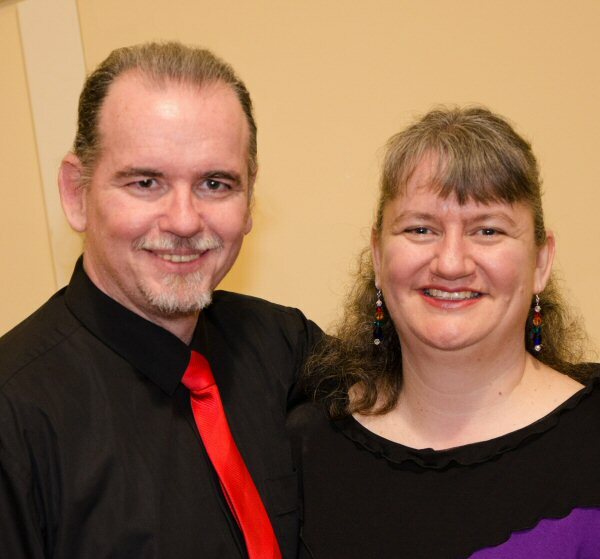 Andrew & Sarah formed The Adelaide Allsorts in 2010 with the vision to create a Mixed Barbershop chorus with the experience gained singing in a successful mixed barbershop quartet 3 Tarts & a DIVA!.